All roll-out carts are sanitized and deodorized while in service with each pick up from April through November. We provide weekly service under a monthly FLAT RATE price. We do not charge our clients any fuel fees, environmental fees, activation, or rental fees. 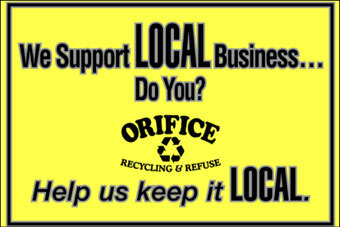 Orifice Recycling & Refuse is advancing by keeping a neat and respectable image behind its work. 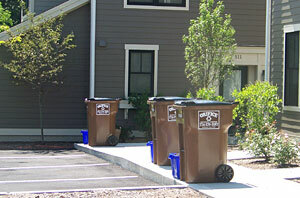 Lets face it each week the residents in your association bring their trash out to the street or in front of the garage and it stands out. 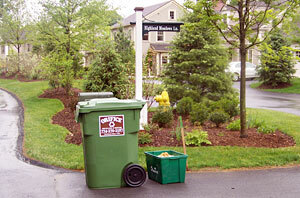 Even on a day when the landscape on your property is at its best the trash is still an eyesore. Orifice Recycling & Refuse understands this, so we make it our job to make your collection areas cleaner and more organized (using our roll-out containers or your own barrels) then when we found them. This is what separates us from the others. We use a personal touch for our service that you can only find with the most sincere small business. 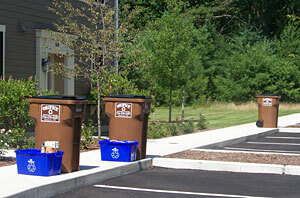 We offer a specific custom service where each week all of the trash and ALL recycling are collected at the same time with one truck. There is never any alternating weeks for collection. Ultimately this means less truck traffic in your property, and less confusion on collection schedules for your residents. Orifice Recycling & Refuse provides roll-out cart and recycling containers for those developments that are interested at no rental fee's.